Welcome back. Today’s blog post reviews a study that found goats prefer people with happy faces. That this will be the fourth time I’ve blogged about goats may come as a surprise to more than myself. The first post probably doesn’t really count. It was only a parenthetical comment about a goat with a penchant for hanging out in a cattle trough (Roosters’ Crowing). The second had its origins at the Saturday morning coffee klatch, when one of the regulars told Vicki about goats that fainted. 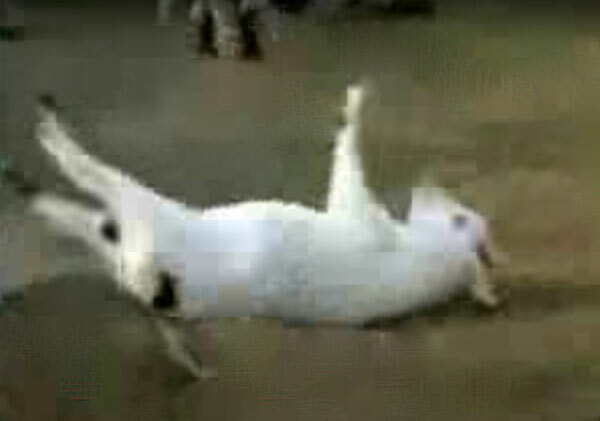 She relayed that to me, which, of course, led to a full-blown blog post about domestic goats, goat intelligence, goats and humans, and, yes, fainting goats (Looking at Goats). I figured that was it. 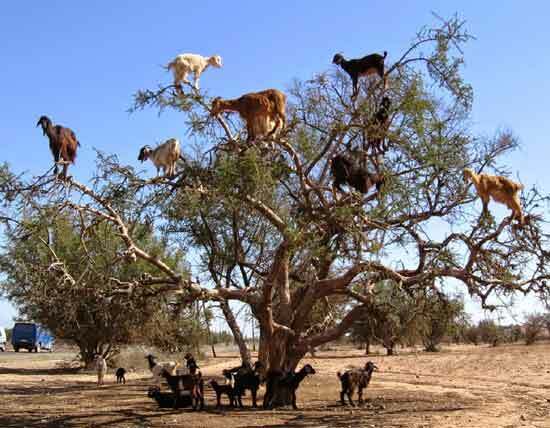 And it was until I saw a study of how goats disperse seeds of the argan tree, which includes climbing the tree to reach fruit that hasn’t fallen (Goats in Trees). Permit me to continue my never-ending saga of goats. This latest study was conducted by international collaborators led by researchers at Queen Mary University of London. They carried out their experiment in a temporary enclosure within the goats’ regular daytime range. Results were based on 20 goats that completed all training and test trials (8 females, 12 castrated males, ages 3 to 19 years, various breeds). The trials involved presenting the goats two greyscale photographs of human faces of the same unfamiliar female or male; one face had a positive, happy expression, the other a negative, angry expression. The two photographs, placed 90 cm (about 3 ft) apart, were printed on white A3 paper, mounted on a square metal mesh at a height of about 60 cm (about 2 ft). Training was designed to motivate the goats to approach the side of the enclosure that would display the photographs. For training trials, the photographs were hidden. One experimenter stood between them, looking at the ground with a neutral facial expression, holding a food reward in each hand. Another experimenter stood 5 m (16.4 ft) away with a goat on a leash, looking with a neutral expression away from the first experimenter. Once released, the goat had 30 seconds to get the food reward or be dropped from testing. The goat was subjected to three trials before every testing session. Set up for training trials, showing enclosure, experimenter E1 between locations where photographs will be displayed, and goat released by second experimenter E2 (from rsos.royalsocietypublishing.org/content/5/8/180491). Immediately after training, the goat was returned to the starting point, while the first experimenter revealed the two photographs and exited the enclosure. The second experimenter then turned and released the goat toward the photographs. The goat was free to move around and interact with the two photographs. 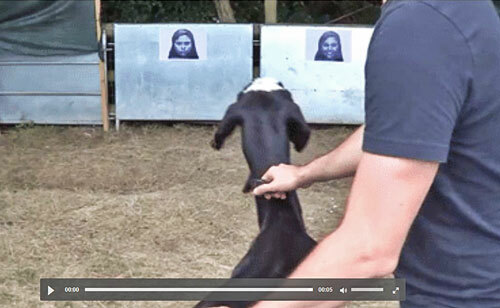 Goat being released in test trial to interact with photographs of angry and happy faces (from video accompanying rsos.royalsocietypublishing.org/content/5/8/180491). They tested each goat in four sessions, two weeks apart. Each session consisted of three training trials and one test trial. For each test trial, half of the goats saw male faces, half saw female faces, half saw the positive face on their left side first, half saw it on their right side first--all in random order within and between goats. The researchers videotaped all trials and analyzed all aspects of the goats’ behavior using a Simple Video Coder. The 20 goats that completed all trials preferred to approach happy faces first regardless of the gender of either the human faces or the goats. 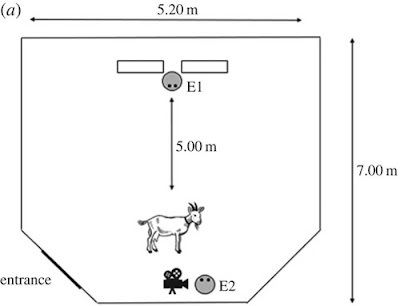 In addition, the goats interacted first, more often and longer with happy faces when the faces were presented on the right side versus the left. This suggests a right-brain hemisphere dominance for processing negative emotions and a left-hemisphere dominance for processing positive emotions, which has been hypothesized for mammals. As I described in a recent blog post (Horses Don’t Forget), many animals can recognize human faces; dogs and horses can also recognize human facial expressions. This study of goats provides evidence that the domestication histories of dogs and horses is not required for being able to distinguish human emotions based on facial cues. Is it true of other animals?